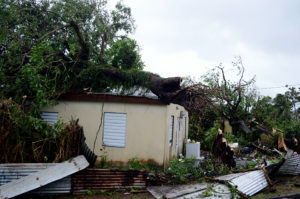 BASSETERRE, St. Kitts, September 27, 2017 (Press Unit in the Office of the Prime Minister) – Citizens and residents of St. Kitts and Nevis, who reported damages to their homes following the passage of Hurricanes Irma and Maria, are being encouraged to take advantage of the recently introduced duty-free concessions on the purchase and/or importation of building materials to repair damages to residential properties. This Team Unity Government initiative, which runs for a period of six months, was first announced by Prime Minister, Dr. the Honourable Timothy Harris on Saturday, September 23, during his post-Hurricane Maria national address. “The Government is intent on helping to restore normalcy to the lives of all persons in the quickest time possible. We also hope that the repairs would result in a much stronger and more resilient housing stock in the Federation,” Prime Minister Harris said. The duty-free concessions exempt successful applicants from paying import duty and customs service charge on building materials. Speaking with the Press Unit in the Office of the Prime Minister earlier today (Wednesday 27), Deputy Financial Secretary, Mr. Calvin Edwards, said the Ministry of Finance will rely on a list of names prepared by the National Emergency Management Agency (NEMA). However, Mr. Edwards stated that provisions are made to accommodate homeowners who did not report hurricane damages to NEMA. “Those persons can still come and fill out an application form. 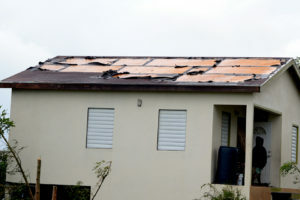 The homeowner will get their contractor to prepare estimates of the damage and then the building inspectors [at the Ministry of Sustainable Development] would go out and verify that information,” Mr. Edwards added. 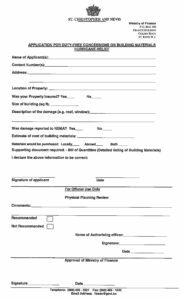 Application forms are available and can be collected at the Ministry of Finance, the Treasury Department, Inland Revenue Department, NEMA, or downloaded from the Ministry of Finance’s website atwww.mof.gov.kn. Deputy Financial Secretary Edwards further noted that designated persons are stationed at each location to assist applicants in understanding and completing their application forms. Preliminary estimates indicate that the public sector in St. Kitts and Nevis received damages of over $140 million as a consequence of Hurricanes Irma and Maria.